A while ago, [Eric Strebel] created a backpack hanger. The result was great — by just bolting this backpack hanger to the wall, he kept his backpack off the floor and out of the way. There was even a place for him to set his phone to charge. [Eric] is thinking about turning this idea into a product, and just posted a video on his process of making a cardboard mockup. Since this is a study in industrial design, any mockup will need to keep in mind how the finished article will be constructed. In this case, [Eric] is going to use 4-5mm thick aluminum, cut on a water jet, bent into place, and finally anodized. The finished product will be made out of bent sheet aluminum, so this little bit of product design will use Matboard — a thick, heavy cardboard often used for mounting pictures in frames. The Matboard will substitute for the aluminum, as it is carefully cut, bent, and glued into shape. The tools for this build are simple, just a hobby knife, razor blade, ruler, and a pen. But there are a few tricks to working with Matboard. To bend these pieces perfectly, [Eric] is painting one side with water. This loosens the fibers in the Matboard, allowing for perfect creases before one layer of the build is glued together. Once a few layers of this Matboard are glued together, the finished product becomes less like cardboard and more like a very soft wood. This allows [Eric] to use belt sanders and countersink drill bits to give a little bit of polish to this one-off prototype. This finished article works great, and now [Eric] is looking at taking this idea into production. [Josh Levine] mercilessly tears a Fingerling Monkey limb from limb on his blog, and points out some interesting design decisions made. While some elements of the toy are rather clever, there’s a few head-scratchers to be had inside the Fingerling. It’s interesting to see the final results of a decision process that had to balance the relatively rough life such a toy will live with the ever crucial cost of production. 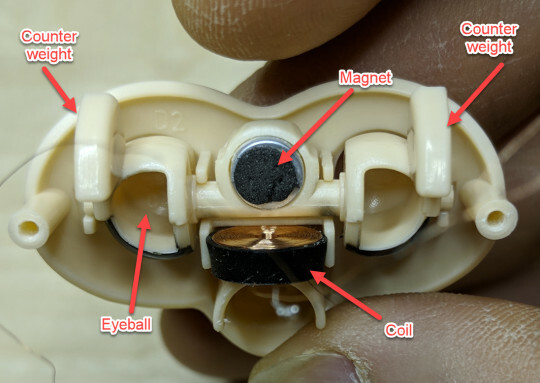 The eyelids are particularly well thought out, operated by charging a coil under a magnet which is embedded in the plastic. Opening and closing the eyelids without a separate motor or gearbox is not only easier and cheaper, but prevents the possibility of damage if a child attempts to force open the eyes or otherwise manipulate the mechanism. Other cost saving measures include the use of foil tape as a capacitive sensor, and simple ball-filled tilt sensors to detect orientation rather than an expensive accelerometer. Interestingly, other parts of the toy seem overengineered in comparison. A cam and limit switch are used to detect when the Fingerling’s head has turned to its maximum angle, when it would have been cheaper and easier to simply detect motor stall current. If you’re interested in seeing what makes popular toys tick, we’ve got a number of plaything tear downs which are sure to keep you satiated until the next big holiday toy rolls around. Is Robot Butter Better Butter? Humans have been making butter for thousands of years. If you have a cooperative cow or sheep and a means to agitate her milk, butter is not far behind. So why would you employ a $15,000 industrial robot to make butter? Because – robot butter! Actually, Robutter is a design experiment by [Stephan], [Philipp], and [Jonas] to explore where craft ends and industrial processes begin, and to see how automation adds or removes values from traditional products. It’s a fair question, given that butter can be churned with everything from animal skins to massive continuous churns. So the team programmed [DIRK], a Fanuc LR Mate 200ic which is normally more at home on an assembly line, to carefully agitate a container of cream. After a bit of fiddling they found the optimal position and movements to produce a delicate butter that looks pretty tasty. The video after the break shows the process and the results, but sadly there’s no taste test of the Robutter against grocery store butter. It may come as a surprise that Hackaday appears never to have featured a butter making project before. Sure, we’ve got a lot of food hacks, most of which seem to involve beer or coffee. But we did run across a recent article on a buttermilk pancake-making robot that you might like to check out.